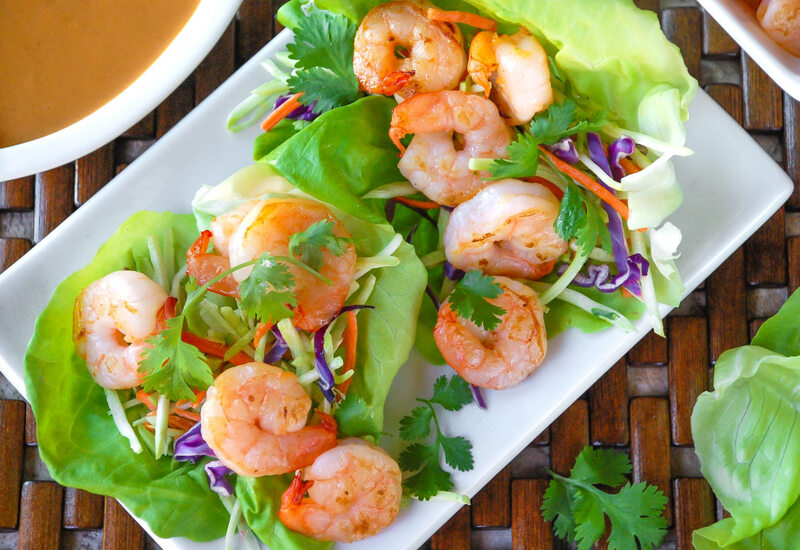 Healthy, low-carb lettuce wraps are ready in minutes thanks to prepared broccoli slaw and quick-cooking shrimp. They're served with a fiery peanut sauce uses that only five ingredients and delivers a total flavor bomb in your mouth. This peanut sauce also makes a delicious salad dressing. To make it thinner: add a little coconut milk or water to desired consistency. Double up on lettuce leaves to make a sturdier bed for the wrap. This is a perfect dish to take with you to a tailgate or picnic, as the shrimp is delicious whether served hot or cold. This recipe would also be delicious with sliced, sautéed chicken thighs in place of the shrimp. Vegetarian? Cut a 1-pound block of tofu into strips, and pat dry. Heat a couple of tablespoons of vegetable oil in a skillet, and cook tofu strips until golden brown, about 5 minutes per side. 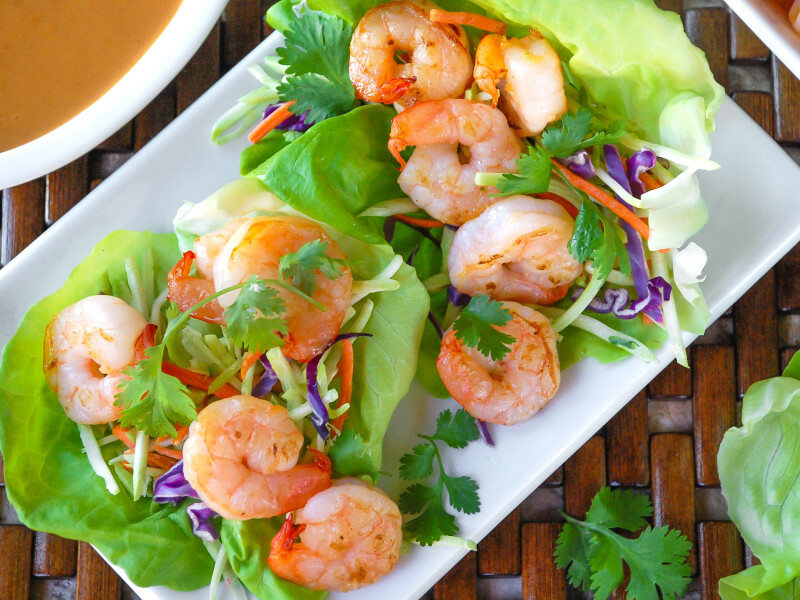 Place in lettuce wraps instead of shrimp. Per Serving: 446 calories; 27g fat; 19.6g carbohydrates; 36g protein; 240mg cholesterol; 1721mg sodium. Easy and yummy lunch for the week! The sauce made enough that I also put it on grilled chicken for dinner one night - delicious! Great snack during work! I believe it tastes better when the shrimp is served cold. I made this with almond butter instead of peanut butter (not a peanut butter fan) and it worked very well! Great recipe to prep the shrimp the night before to pack up for lunch the next day. These shrimp lettuce wraps were so good! I love lettuce wraps anyways, but always make them vegetarian. This version was so good, the peanut sauce was perfect. It's also super quick to make, so during the week I don't have to spend an elaborate amount of time in the kitchen. I added avocado and cucumber to my lettuce wraps, and they were so delicious. I also garnished with cilantro, as shown in the picture. So yummy! The peanut sauce is a must. 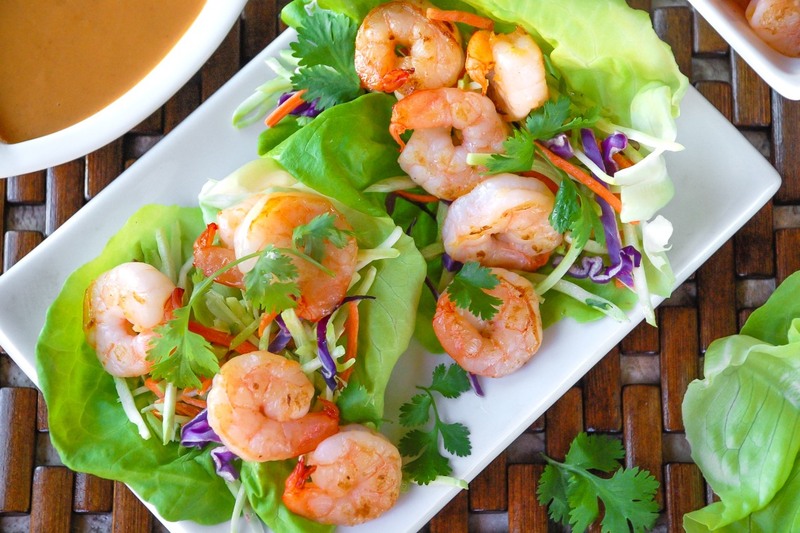 Super simple shrimp lettuce wraps! I changed the peanut sauce a little. I added rice vinegar, ginger, and skipped the sriracha all together. This is super quick and tasty, especially on weeknights. I'd definitely make it again. I made a "minced" shrimp lettuce wrap following the same ingredients for this recipe. I really liked the peanut sauce, too. Even though the sauce has Sriracha in it, I drizzled extra Sriracha on top. So yummy!